Week two of What I wore Wednesday went great! I noticed a colorful and positive change in my outfits this week. Something about taking photos of yourself in each outfit makes me try a little bit harder! Get the low down on why I am including What I Wore Wednesday posts here, but the main reason is to motivate myself to put in a little extra effort each and every day. What I wore Wednesday is a way for Mom’s to share outfits and get inspired to get dressed even if they aren’t heading off to work each day. The Pleated Poppy has an amazing series where she shares what she wears each week to keep herself accountable for getting out of her pajamas everyday and I’m joining in the fun! This is one of my absolute favorite outfits and it was inspired by this casual and cute outfit posted on Polyvore. Only problem is that this outfit would set you back $1,701 and that doesn’t include the shades, shoes or the watch. Ouch! 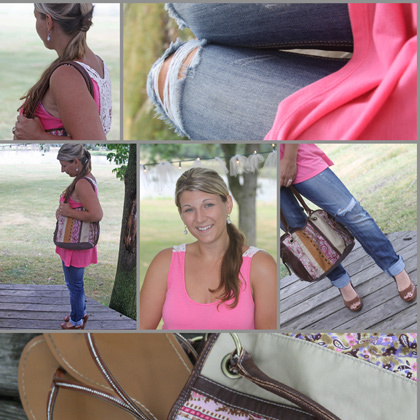 My entire outfit set me back only $35.00 and includes jeans that I wear A LOT! When I passed this bright pink tank top at our local Kmart while stopping to pick up sunscreen I immediately thought of my inspiration picture. This outfit is so comfy and fun that I could wear it every day. I feel great wearing it and it is just as comfortable as staying in my pj’s. Notice the flip flops tucked in my bag? The wedges only lasted while I was flying solo to an appointment. Hair: I took advantage of my straight hair from the day before using my favorite dry shampoo from suave. I have tried a few brands (drug store and professional) and this is my favorite for my hair. A can is less than $3.00! I added a bit of volume to the top and a quick side ponytail wrapped in a section of my hair for a simple style. Another casual and comfy outfit but much better than pj’s. Hair: I added a little volume to blow dried hair then made a messy and very loose side braid and left the end of the braid un braided. A little twist and a few pins turned my messy braid side up-do with loose pieces. Quick, easy, and perfect for a summer day. This is a great way to finish off hair that I don’t have time to curl or straighten before I have to head out the door – I only need about 10 minutes to do this. Very cute & inspirational…thanks…keep it up! I love your first outfit, with the aqua shorts and the gray tank top. I’m considering using the same colors in my dining room (the walls are already a color I affectionately call “elephant”). Thanks for sharing! Thank you and that seems like that would be a bright and cheery color combination for your dinning room!